Dalmation toadflax grows up to four feet tall on a stout, erect, branching stem. 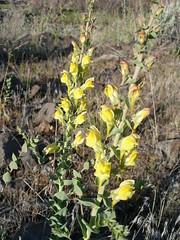 It can easily be mistaken for a snapdragon with its bright yellow flowers that grow in a head at the end of the main stem. The flowers are about an inch long, with two lips and a pronounced opposing spur. The bottom lip is raised and covered with orange hairs. Bright-green waxy alternating leaves grow one to two inches long all along the stem and appear to have a powdery coating. The common name toadflax may have originated because it was thought that the flower looks like a frog’s mouth, or perhaps because toads will sometimes shelter themselves amongst the branches of the plant. Bumblebees are the usual pollinators but seeds are also spread by seed-eating birds. This plant has deep tap roots and extensive lateral roots, and is capable of forming colonies through buds from creeping root systems. It will aggressively colonize disturbed or cultivated ground and out-compete desirable native plant species. Hand-pulling, mowing, and tillage can be effective in controlling Dalmation toadflax. Efforts must begin in early June and be repeated so that there are never more than seven to ten days with green growth visible. It is necessary to repeat control efforts for at least two years. Biological controls are also available.